Tomato Essence is actually the clear or nearly clear liquid that is the real juice of the tomato. What we typically know as tomato juice is actually pureed tomatoes, often thinned with water. But if you strain tomato chunks through cheesecloth for several hours, what comes out is Tomato Essence, a liquid that has such deliciously pure tomato flavor you’ll want to spoon up every drop. 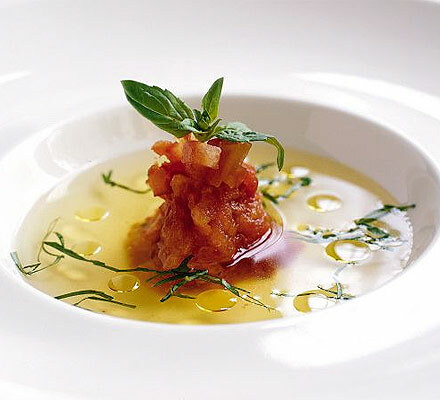 This liquid can be used on its own, as a soup, spiced with salt and pepper, drizzled with fruity olive oil and garnished with finely diced tomatoes and cucumbers and basil chiffonnade, all thoroughly chilled, for an elegant first course. Or you can use Tomato Essence to dress a salad, per the recipe below. Adrienne demoed this for a class at Brookside July 16 2014. Pulse the tomatoes in a food processor until they are chunky, not pureed. Place a layer of cheesecloth in a strainer over a bowl. Put the chunked tomatoes into the strainer and refrigerate for several hours of overnight. You should get 1½ to 2 cups of clear or nearly clear liquid. If you want it perfectly clear, pour the liquid through fresh cheesecloth a few more times. Use the tomato pulp to flavor soups and stews. This colorful mix of summer fruits and garden produce is dressed with Tomato Essence (recipe above). On the various salad ingredients, I like the smaller Champagne mango, which is astonishingly sweet, or better yet, if you can find them, the perfumy green Thai mangoes, available throughout the summer at Asian supermarkets. Mixing different colored tomatoes in this salad gives it a vividly beautiful appearance. The hit of hot chiles really brings out all the incredible flavors, but you can omit it if you absolutely do not tolerate the heat, or you can seed the peppers, which will significantly reduce the amount of capsaicin, where the heat lies. If you can’t find Thai or serrano chiles, use jalapeno, roughly chopped. This recipe comes from Martha Stewart. Brookside July 16, 2014. Peel mango and cut flesh from pit; discard pit. Cut flesh lengthwise into 1/4-inch slices. Toss with cucumber, tomatoes, chile, chopped basil, and oil. Season with salt and divide salad among 4 bowls. 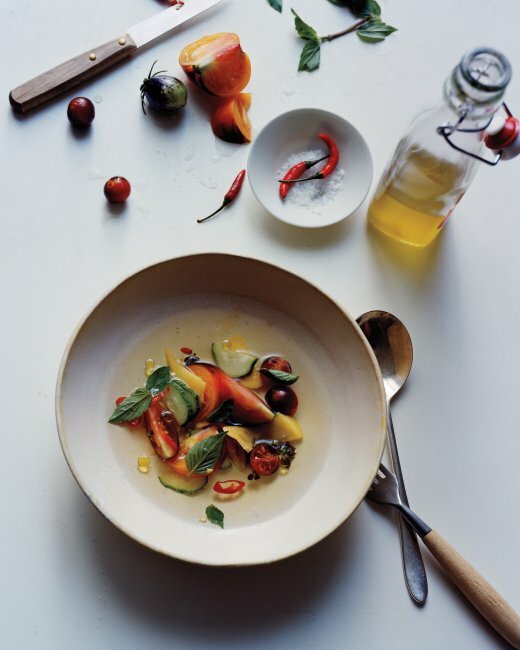 Divide tomato essence among bowls, garnish with remaining basil, and drizzle with more oil. This entry was posted in Recipes from Adrienne's pantry, Salads, Soups and tagged chiles, cucumbers, pepper, salad, soup, tomato, tomatoes, vegetarian. Bookmark the permalink.